Throughout your career, as a responsible citizen, you have worked with the government. From that experience, you came to see the limits of government in defining the science agenda. Tell us a little about that. One incident was in the late fifties. You were on a commission for the Air Force that produced a document with advice [on future technologies] with no mention of [going into] space. This was before Sputnik. So what are the limits [in government's vision] and the possibilities, and what is the responsibility of the scientist in that regard? Well, so far as limits are concerned, I think we all have to be a little modest about our own limitations. Everybody's limited. I'm sure there are interesting things around I haven't imagined and you haven't imagined and so on. We miss things, everybody does. We have to keep helping each other and we have to keep exploring, and so on. The Air Force wanted us to study what would be the possible technologies of the next twenty-five years that they should be working on. They got together a group of scientists and engineers and they had a lot of good ideas. At that time, rockets were around, but they hadn't been very successful yet, but we talked about possibly going into space and space work. And the Air Force said, "Oh please, don't say anything about that, because Congress will think we're just playing around." Now this is purely political, you see, that "well, please don't say anything about that because Congress will kill us because they think you're just playing around talking about space," and so on. "We're supposed to be making military efforts, so don't put that in your report, please." So we didn't. That was the summer of '57. The fall of '57 Sputnik went up, and then suddenly Congress changed completely. Everybody said we must get into this. And so the whole report was rewritten and published the next year with lots of space in it. So what then does the scientist do? If he's a citizen of a country, he wants to offer his services to this government as a responsible citizen. Scientific advice is very important to government, and politicians realize that. Politicians recognize that there are certain scientific things they really don't understand. They have to call on scientists. I think in most other fields, such as how people behave, they probably think they understand it. They may or may not, but they think they understand it. Whereas in science, they recognize the things they don't understand, so they do call on scientists, and scientists have an opportunity then to advise the government. In my view, it's very important that scientists advise government without having a stake in the government or a stake in the industry that may make the things that they're advising on. This means that academic scientists are important, because they can go in and give the government advice. If the government doesn't like it, they can come back home and they still have a job and they don't have to worry exactly about whether the government takes the advice. This means they can be more objective and not adhere so much to these political pressures, you see. That kind of advice has been very important. Eisenhower first formed a very good committee to personally advise the president, and he listened carefully to them and it had a very important role. I think scientists are still advising the government extensively, but they don't have quite as critical a role as they did during that time, when everything was changing rapidly. But they must be there, and I think we scientists have a duty not only to talk to the public and try to help the public understand, but also, when asked, at least to try to give advice in Washington and serve on committees, study things, and make reports about what seems to be best and what seems to be workable and not workable. Our National Academy of Sciences does that, and there are other groups. At the time I first started, there weren't so many people doing it, and this is one reason I agreed particularly to do it. I gave up two years of my research work to go to Washington to do it, because I felt there weren't enough people there. Another way that scientists make a difference is that science is a global phenomenon. You have already talked about how you would learn from scientists, not only in this country but all over the world, about progress in the developments that led to the maser. During the Cold War, meetings like Pugwash and the conversations that were going on between American scientists were critical, actually, in contributing to our understanding of how we could draw the limits to the relationships between the U.S. and the Soviet Union. On one occasion you were involved in discussions on banning weapons in space. Tell us about that. It's quite true that scientists are important in international relations. Science is a social affair in the sense that everybody interacts, and it's a universal thing. If you discover the right science, it applies to everybody. People like to try to understand and learn from each other. If somebody over here has discovered something, it's important for you to know that and what it is. And scientists can talk to each other then and trade ideas in a friendly way on scientific problems. This means they're really internationally minded. Now, in the case of the Soviet Union and of China -- any countries which are cut off -- those countries recognize that they must keep up with science. So they're eager for their scientists to be in contact with scientists in other countries. And vice versa, for that matter. So there have been international meetings of scientists, and scientists can talk with each other in a rather friendly way about things and be reasonably frank. A great deal of information was learned about the Soviet Union through discussion among scientists, and the Soviets learned a great deal about the United States through those discussions. In fact, I once went over and had a substantial conversation with Gorbachev when he was early in his power. Went over with some politicians, and Gorbachev said, "Most of what I understand about the West comes from the intellectual community here. I have to learn from them." By that he meant the scientists and the artists who went outside and could learn about other societies. And he was very frank about it. In addition, we could see that the scientists understood our points of view and what we were trying to do, and many of those scientists were advising the Soviet government on military things and other things. So we could get together and talk in a friendly way and recognize what you had to do to maintain peace and prevent too much danger. So that interaction, I feel, has been very important. The same thing is true in China. The Chinese are very eager to understand American scientists, science, and technology, and so there was an exchange; I went over as part of an exchange on astronomy. Because it was astronomy, we went to observatories were most Westerners weren't allowed to go at all, and we could cruise around and try to understand the country. Not only did those countries which are more or less closed off learn a lot from us, but we learned a lot from them and were able to advise our government. In this particular case of Pugwash meetings -- that's a group that got together to try to talk about possible peace, and it was largely scientists and academic people -- I was able to talk with a leader of the Soviet space program, and we talked about the possibility of banning any mass-destructive weapons from spacecraft, from orbiting spacecraft. And he agreed it would be a good idea, and he had been a former general, too. So he, I'm sure, took it back to his country. I took it back to our leaders. And in a couple of years there was an agreement between the two countries to ban all weapons of mass destruction from satellites, which I think has been a good agreement. But the idea started there; of course, it had to be carried through by politicians who also understood and saw it. 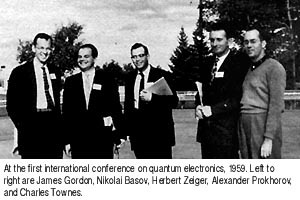 Photo caption, Conference: "At the first international conference on quantum electronics, 1959. Left to right are James Gordon, Nikolai Basov, Herbert Zeiger, Alexander Prokhorov, and Charles Townes."